Thanks to new reproductive technologies and new ways of forming families, the world of parenting is opening up as never before. What defines a legal family? Should there be any restrictions on buying and selling eggs and sperm, or hiring "surrogate mothers"? How many parents can a child have? While there's no going back to the traditional family, Mary Lyndon Shanley shows us that we don't have to live in moral chaos. She offers a new vision of family law that puts each child's right to be cared for at its center, while also taking into account the complex needs of every family member. "If you want to consider all sides of the thorniest issues affecting creation of a parent-child relationship . . . you could read over a hundred books, essays, and law review articles. Or you could read this book." "Critically sophisticated yet readily accessible." "This distinctive and valuable contribution ensures that we protect the interests of children and other vulnerable people while sustaining the bonds of intimacy." 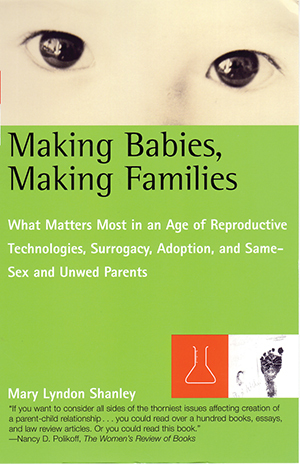 "Making Babies, Making Families takes on all the hard questions . . . and with unflinching clear sight, carefully defined principles, and moral compassion creates a compelling basis for answers."